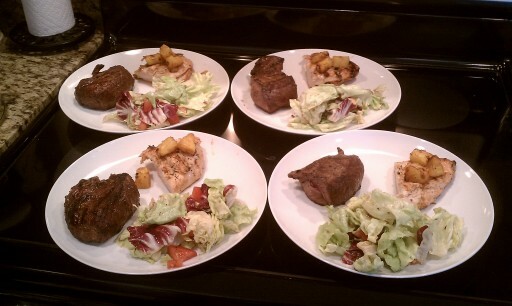 We had a couple friends over for dinner tonight, and I couldn’t decide on chicken or steak. So I went with both. 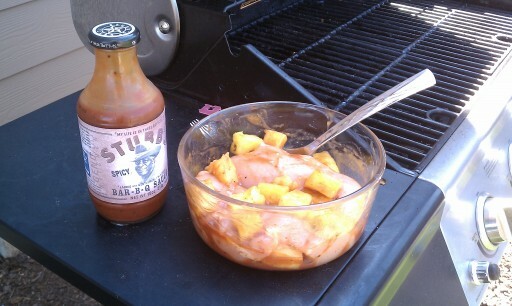 For the “wing” portion of the meal I marinated some chicken breast with some Stubbs Spicy BBQ Sauce and fresh cut pineapple. I grilled the pineapple along with the chicken to add a little sweet flavor to the meal. The “hoof” portion was a petite sirloin steak seasoned with black pepper and sea salt. Cooked medium-rare. All of this was served with a light and fresh garden salad topped with a balsamic vinaigrette dressing. The only part of this night that was better than the dinner, was the dessert BBQ which I will post about tomorrow.